Wow! Look at this nice color! 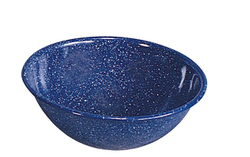 Select this Stansport 7-Inch Speckled Blue Enamel Mixing Bowl for its old fashioned look but its up-to-date sharp accent color for today's kitchens. The high quality durable steel bowl has a double coated enamel finish that is kiln dried to produce a hard surface that is difficult to scratch with stirring spoons. A sturdy bowl to add to your camping equipment. Steel base Is high quality steel, durable, and unbreakable. Enamel finish Is glazed with a double coating and kiln dried to achieve a hard surface that is difficult to scratch and easy to clean. Royal Blue with white speckles Provides an attractive finish for any kitchen counter. Colored mixing bowl Is ideal for your kitchen, outdoor living, and for camping.